Mica Hardware | Painting over an oil-based painted wall! Home » Painting over an oil-based painted wall! Painting over an oil-based painted wall! Looking to paint over a wall that was previously painted with an oil-based paint? 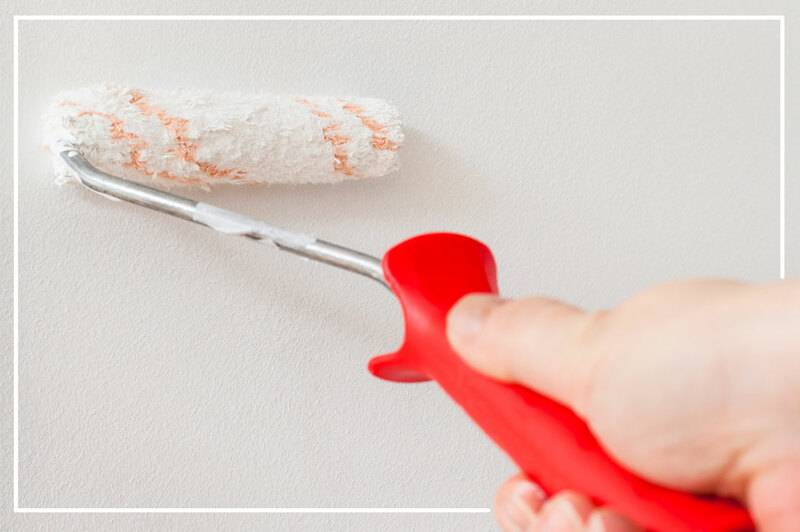 Learn more on the preparation needed to repaint your wall! The solvent in your old oil-based paint forms a barrier that prevents water-based paint from adhering properly without some surface preparation so your best option is to use a another oil-based paint. To do so, you need to ensure that the surface is clean, free of any grease or oil, and any other debris such as loose paint flakes or flaking areas. A good product to use to do this is sugar soap (so called because in its granular state it resembles sugar). It is available in granular form or liquid. In the former casem, dilute in water as per the package instructions and then clean the surface (see safety advice below) and allow it to dry. Then prepare the surface by giving it a light sanding with 180-220 grit sandpaper. Pay particular attention to sanding the edges of paint where it has flaked off. The sharp edges will stand out unless smoothed down. Apply a coat of a quality oil-based bonding primer. This will improve adhesion and also seal any bare spots. Then apply your first coat of paint, and if necessary a second coat, with a very light sanding after the first coat to ‘key’ the surface. Many believe that it is not possible to apply water-based paint (by the way, latex paint is water-based) over oil-based but actually it is possible. Clean the surface with either sugar soap, as above, or with a sponge or cloth dipped in a TSP (trisodium phosphate)-water mix. (Trisodium phosphate is a degreasing agent – a stain remover and a general cleaning agent, but you need to handle it carefully. It’s not bad in small doses, but the dry powdered form (it is very soluble in water) of trisodium phosphate can irritate sensitive membranes and the skin and so this product should be handled with care.) See safety advice below. Having applied the cleaning solution, sponge it off with a sponge and clean water then allow the wall to dry thoroughly. Once the wall is dry, sand the surface lightly with 180 to 220 grit sandpaper to remove the gloss and ‘key’ the surface. Follow that by giving the surface a light wipe with a dry cloth to remove any debris left over from the sanding. Then apply a coat of a quality water-based bonding primer and allow it to dry. Wear rubber gloves, safety goggles, and a top with long sleeves as wella as an apron. If any splashes on to any garment, take it off immediately and soak it in water to dilute the chemical and wash it out; the main reason to remove a garment with any part of is wet with the cleaner is that it will touch your skin. Don’t let the chemical touch bare skin or your eyes. If any gets on your skin wash the area thoroughly with soap and water. Stop using it immediately if you experience any redness, prolonged irritation, blistering, or pain. If any gets in your eyes, flush them immediately with clean water for at least 15 minutes and get immediate medical attention. If, for some reason any is ingested DO NOT induce vomiting. Drink a glass of water or milk and get immediate medical attention.